Women have lives, pregnancies, births and children, NOT obstetric careers! I think the title of this post probably gives a bit of a clue as to where I’m going with this! Last week, I spotted the 2014 themed edition of the British Journal of Obstetrics and Gynecology, which focuses on the important topic of vaginal birth after caesarean (VBAC). All of the articles are free from the link above and I suspect that, like me, many visitors to this website will be heartened by some elements of some of the articles and dismayed by others. The issues that this journal discusses are important and timely, and I appreciate that taking (further) issue with some of the language used in this area is not the only or highest priority. But, as at least some of those who are currently writing on this topic appear to be genuinely seeking to understand why some women make decisions that are outwith obstetric recommendations, I feel that more needs to be said about some of the terminology used in such papers. I would argue that a good next step towards addressing the paternalism that is increasingly acknowledged by such authors to be problematic would be some modification of the language used to discuss these issues and the women who face them. I do want to add a caveat before I go on, though. While it is true that this particular issue of this particular journal inspired this post, my words are genuinely not aimed at a specific journal, profession or group. This kind of language is used in many fora and by a number of different groups and I am particularly keen to make clear that this not intended as an anti-obstetrician rant, as I know many fabulous obstetricians who would never dream of using such terms, and a good many non-obstetricians who use them all the time… Nonetheless, the obstetric paradigm – which is about ideas, not people – has come to be a dominant, authoritative model in some cultures and one (possibly unintended) feature of this is that the language that has developed within this paradigm can sometimes place so much emphasis on the professional definition of a situation or the role of the rescuing professional that it implies a devaluing of women as birth-givers. T he word ‘patient’ carries overtones of medicalisation and, to some people, its use can imply that the user sees pregnancy in medical terms which render a woman in need of and subject to medical care. 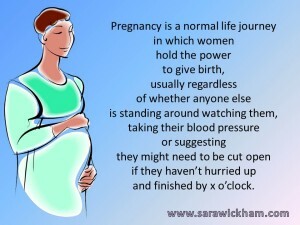 From the perspective of many women, pregnancy is a normal and natural life journey in which women hold the power to give birth, usually regardless of whether anyone else is standing around watching them, taking their blood pressure or suggesting that they might need to be cut open if they haven’t hurried up and finished by x o’clock. Some people, of course, do not mind the word ‘patient’ at all. However, in a long career of writing about birth, I have genuinely never encountered a situation where the use of the word ‘woman’ rather than ‘patient’ would have caused disrespect to anyone or detracted from the accuracy of what was being written or said. I have, on the other hand, encountered many situations where the use of the word ‘patient’ caused offence. While the terms ‘trial of labour’, ‘trial of labour after caesarean’ and such like may be accurate descriptions of the way in which some health care providers view a woman’s ability to birth and the context of having a vaginal birth after a previous caesarean section, these are also offensive to some women and can imply that, while their caregivers are willing to ‘let them have a go’, they do not really believe that they have much chance of actually giving birth without the aid of Western medicine. Labour and birth are a journey, and I don’t suppose anyone who was about to undertake a potentially challenging journey of any kind would be that pleased if the very people claiming to support them were openly talking about them only ‘trying’ to undertake the journey, with the ever-present implication that they might fail and need to be picked up by an emergency vehicle that was standing by. I don’t think that there are many women who don’t want to have access to that emergency vehicle (or repeat caesarean section) if they really do need help, but I do know that some find it distressing and offensive when caregivers use language that implies doubt in their ability to succeed. The term VBAC is almost always a viable alternative and it was in fact coined by the fabulous Nancy Wainer as a more accurate and neutral alternative to this kind of terminology, although I have heard Nancy say that, if she knew the acronym was going to catch on, she might have called it something prettier! Finally, as the title of this post implies, I want to take issue with the term ‘obstetric career’. Women give birth, experience pregnancies, live lives and have families. Some women have great birth experiences, others do not; some have lots of children, some have none, some lose one or more of their babies; some have easy births, some have hard or dramatic births, and it goes on, for there are as many individual experiences that can’t possibly be expressed in a few sentences or a single term as there are women in the world. All of these amazing, magical, tragic, fabulous, life-shaping experiences literally form the fabric of a woman’s life, and to define such an important part of someone’s life solely from the perspective of a professional group is to devalue the human being who is living at the centre of her own experiences. There is a whole range of terms that can be used instead of terms such as obstetric career or obstetric history, including ‘birthing experiences’ or ‘birth history’, both of which serve the same end but acknowledge that it is the woman who lives at the centre of her experiences. Most of these terms are historical, and I am not suggesting that anyone began to use them with the intention of demeaning women. But the fact is that they can and do offend, sometimes mightily, while there are neutral alternatives in every case. Moreover, it is within the power of each of us to choose whether we continue to use such terms or instead choose language that is respectful, positive, encouraging, and that acknowledges the centrality of women in their own birth-giving. ← Want to promote normality? Try adding water! Spot on – as always Sara.